Bicycle wheel bearings are located inside the wheel hub. 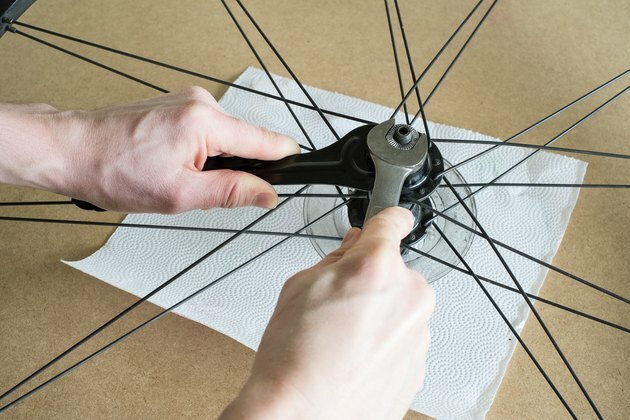 Though they are easily accessed on front wheels, you may need to remove the sprockets to access a rear wheel hub. 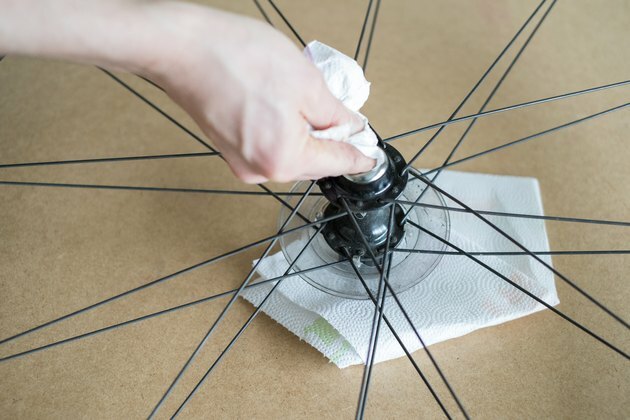 If you’ve ever changed the bearings on a cup-and-cone style bottom bracket, you will recognize the similarities in many steps of this process. Take the wheel off the bike. Release the brakes and unclamp the quick release or use the 17 mm wrench to unscrew the clamping nuts. 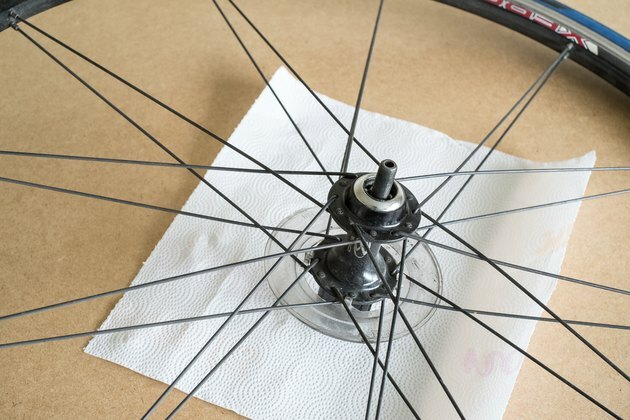 Remove the freewheel or cassette, if required. 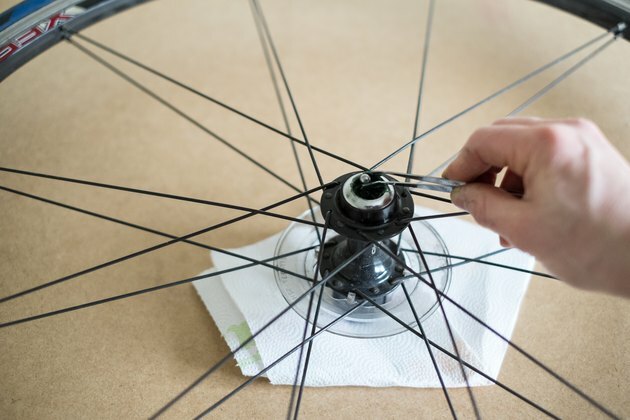 It is generally possible to change wheel bearings in the rear hub without removing the freewheel, but it may be more difficult. If you have a cassette, you will have to remove it. 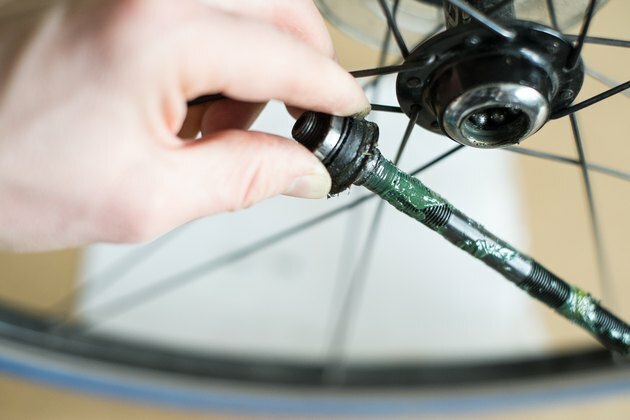 Unscrew the locknut and remove the washers, spacers and dustcaps, if present, from one side of the axle, which is the thick threaded tube running through the wheel’s hub, with the 15 or 17 mm wrench. 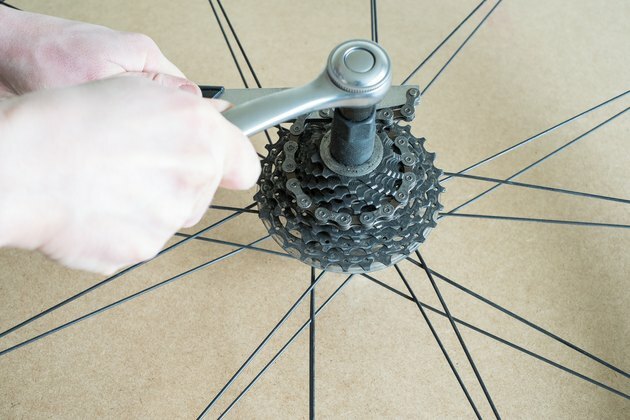 If you are working on a rear wheel, remove the locknut on the side of the hub opposite the freewheel or cassette. Use the correct size cone wrench to unscrew the cone from the axle. Pull the axle out of the opposite side of the wheel. Hold the wheel upright when you remove the axle. Several ball bearings may fall out. 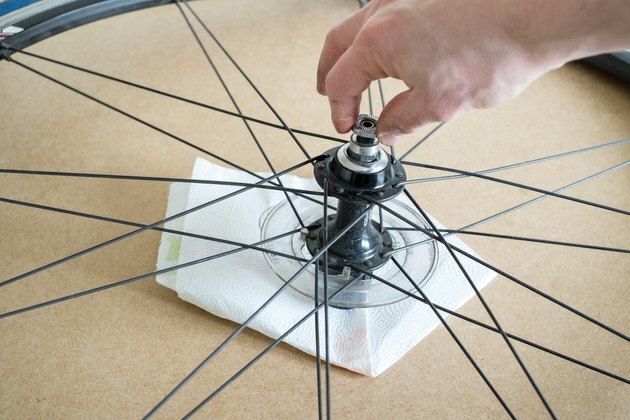 Remove the ball bearings from both sides of the hub, place them on a rag and count how many came from each side. Wipe them with a rag and examine closely for pits or scratches. Discard any damaged ball bearings. Generally, front wheels use ten 3/16-inch bearings on either side of the hub and rear wheels use nine 1/4-inch bearings on either side. Wipe the cups that held the ball bearings clean. Thoroughly coat the inside of the cups with new grease. Use enough that a ball bearing sticks firmly in place when placed in the cup. 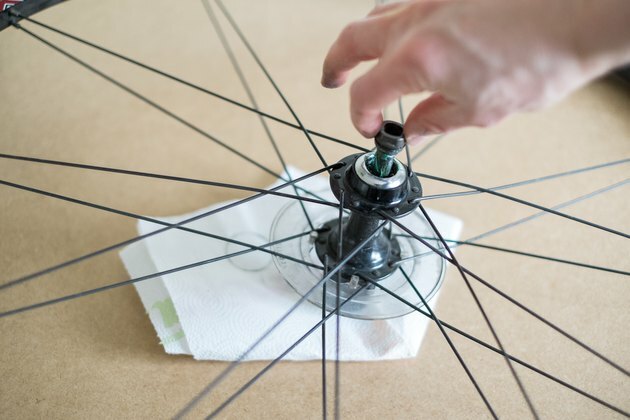 Lay the wheel flat with the side of the hub from which you pulled the axle facing up. Place the correct number of bearings in the cup. Gently flip the wheel over. If bearings fall out, add more grease to hold them in place. Insert the ball bearings in the other cup. Slide the axle back into the hub in the same orientation in which it was pulled out. Screw the cone back onto the axle. When it contacts the bearings, stop. Rotate the axle and push it back and forth. If it moves, screw the cone in more. 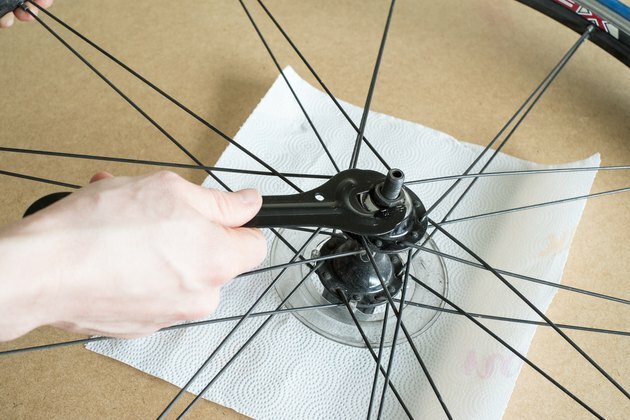 When the hub makes a slight grinding sound when the axle rotates, unscrew the cone a quarter-turn at a time until the noise stops and then unscrew it one quarter-turn more. This allows for the inevitable slight tightening of the cone when you reattach the spacers, washer and locknut without causing grinding. 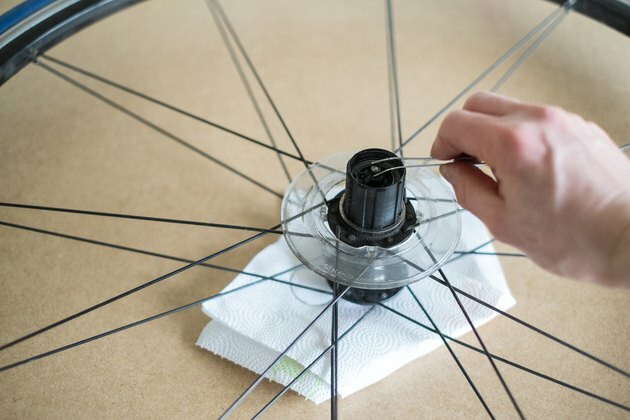 Reattach the spacers, washer and locknut and place the wheel back on your bike. Fifteen and 17 mm wrenches and 13 and 15 mm cone wrenches are the correct sizes for many bikes. 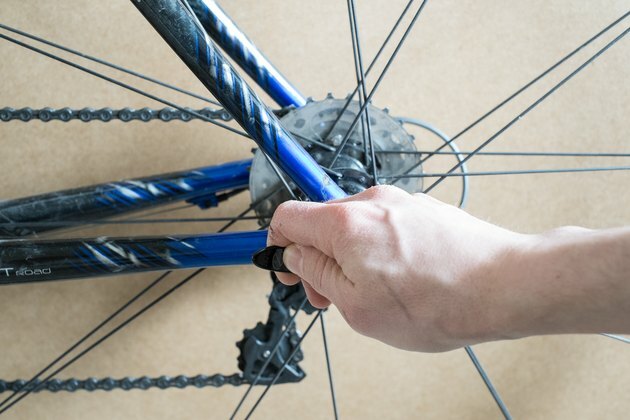 Your bike may require wrenches of a slightly smaller or larger size.